AMHERST, N.Y. – A new online option has been added for Daemen College’s Master of Social Work Program, making the college the only private institution in the Buffalo Niagara region to offer an MSW degree in a fully online format. The online MSW degree is designed for students seeking training in advanced clinical social work practice with children and families. After completion of the graduate program, students will be prepared to apply for licensure at the licensed master of social work (LMSW) level. Accredited by the Council on Social Work Education (CSWE), Daemen’s new online offering will mirror the traditional MSW program’s distinctive curriculum, which is taught by scholar-practitioners. Students will have the option to complete internship requirements at their place of employment or at another organization in their immediate area. Graduates of Daemen’s MSW program, which was launched in 2014, develop advanced skills that are in high-demand by a range of organizations. According to Bessel, 100 percent of job seekers who completed the college’s traditional MSW program secured a position before graduating. 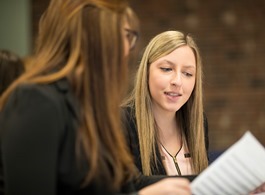 “Licensed social workers are increasingly marketable, and agencies are actively seeking our graduates because they possess the knowledge, skills, and professional attributes that are desirable in a variety of social work settings,” said Bessel. The U.S. Bureau of Labor Statistics notes that overall employment of social workers is projected to grow 16 percent from 2016 to 2026, much faster than the average for all occupations. Applications for Daemen’s online MSW program are being accepted for classes beginning in February and October 2019. For more information or to apply, call 566-7876 or email msw@daemen.edu.